Team Penske’s Newgarden, the reigning Verizon IndyCar Series champion, expressed interest this week in taking his talents overseas to compete fulltime in the FIA Formula One World Championship. As an aside, Newgarden also has penciled a drive in international sports car racing’s 24 Hours of Le Mans onto his motorsports bucket list. “Yeah, I would love an opportunity to try Formula 1,” Newgarden said during a Media Day press scrum at Indianapolis Motor Speedway, site of today’s 102nd edition of the Indy 500. “I think it would be something I’ve always wanted to do at some point in my life. Not that I didn’t want to run INDYCAR, but it’s natural to want to go do something like that. 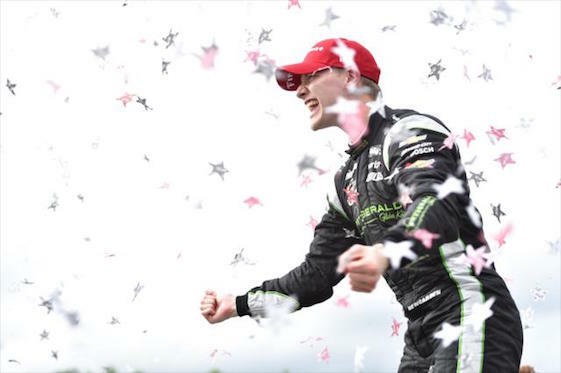 Newgarden, a 27-year-old native of Hendersonville, Tenn., won the Verizon IndyCar Series championship last year in his first season with Penske’s juggernaut and sixth year in the series. Animated, aggressive and articulate, his all-American persona has marked Newgarden for superstardom in a series continually searching for a “face.” Newgarden will start today’s 200-lapper fourth in search of an Indy 500 victory that would add considerable clout to his resume. Penske, meanwhile, clearly is aware that Newgarden _ the latest in a long list of wunderkinds who have made his organization the most successful in open wheel history _ has a serious case of wanderlust. Newgarden strolled with little fanfare through the paddock at Circuit of The Americas as recently crowned INDYCAR champion/interested spectator last October during F1’s annual visit to Austin, Texas, for the U.S. Grand Prix. Haas F1 Team, owned by American entrepreneur Gene Haas, is this country’s only entrant in the globe-trotting FIA World Championship. In its third season, Haas F1’s drivers are Frenchman Romain Grosjean and Kevin Magnussen of Denmark. The team’s development/reserve driver is American teen-ager Santino Ferrucci of Woodbury, Conn. Ferrucci, 19, currently is competing for Trident in the FIA Formula 2 Championship. Magnussen finished 13th and Grosjean placed 15th at the conclusion of Sunday’s 78-lapper through the winding streets of the Principality, an event dominated by Australian Daniel Ricciardo of Red Bull Racing from pole position. Further, Newgarden said he doesn’t necessarily see driving for Haas F1 as a perfect all-American fit for himself. In addition to the race in COTA, F1’s new owners at Liberty Media reportedly are pursuing a second venue in the upscale Miami Beach area. Ironically, F1 competed at IMS on a 2.606-mile infield road-course incorporating approximately one mile of the 2.5-mile oval between 2000 and 2007. The crowd for the first race, won by Germany’s Michael Schumacher for Scuderia Ferrari, was estimated at over 225,000 and arguably was the most-attended event in F1 history. Despite the multi-million-dollar garage and hospitality improvements made by then-Speedway CEO Tony George and the Hulman-George family, the FIA pulled the event from the F1 schedule in a dispute over rising sanctioning fees after the ‘07 race. The Verizon IndyCar Series has kicked off its Month of May schedule here with a points-paying race on a revised 2.439-mile/14-turn road-course layout since 2014. Newgarden started sixth and finished 11th in the INDYCAR Grand Prix on May 12 in his No. 1 Verizon Team Penske Chevrolet. All F1 races are contested on non-oval circuits of varying lengths. Newgarden’s nine career series victories, including two in the first five races of 2018, include six on either temporary street or permanent road-courses. Two of his three career poles also have been scored on permanent road courses. The now defunct Championship Auto Racing Teams sent 1995 series and Indy 500 champion Jacques Villeneuve of Canada to Formula One, where he was crowned World Champion with Williams F1 in 1997. But domestic open-wheel championship-winners Juan Pablo Montoya of Colombia, Frenchman Sebastien Bourdais, Cristiano da Matta of Brazil, Alexander Zanardi of Italy and Michael Andretti of the United States moved onto F1 without noteworthy success over the past two decades. In a career role reversal of sorts, American Alexander Rossi abandoned his pursuit of a fulltime F1 ride in 2016 to drive in the Verizon IndyCar Series. That decision paid off when Rossi won the landmark 100th edition of the Indy 500 in May 2016 for Andretti Autosport and team-owner Michael Andretti. Like Rossi, Newgarden’s racing resume includes seat time overseas _ the traditional “ladder system” into F1. In 2008, Newgarden finished second in the Skip Barber National Series for Racer of Tomorrow LTD after posting three wins, six poles five podiums and three fastest laps in 14 starts. He subsequently was awarded a Team USA Scholarship and competed in the International Formula Ford Festival at Brands Hatch and Walter Hayes Trophy at Silverstone, England, winning Kent Class. In 2009, Newgarden finished second in the MSA Formula Ford Championship of Great Britain with JTR, scoring nine wins, four poles and 16 podium finishes. He also claimed two wins in three Formula Palmer Audi starts at Brands Hatch while also competing in the Formula Ford Festival’s Duratec Class and Walter Hayes Trophy. Newgarden drove in GP3 in 2010 with Carlin Motorsport _ a fixture in European open-wheel racing that is making its Indy 500 debut this weekend with American Charlie Kimball and Max Chilton of Great Britain. Newgarden finished 18th in points for team-owner Trevor Carlin with a best result of fifth at Monza in Italy. He also qualified on-pole for the event at Hockenheim in Germany. Last May, the Verizon IndyCar Series received a huge boost in profile and credibility when Fernando Alonso, the two-time F1 World Driving Champion from Spain, competed in the Indy 500 with Andretti Autosport. Alonso , who drives for McLaren F1, opted to skip the 2017 Monaco Grand Prix _ F1’s crown jewel street race_ to compete in his first oval-track event at IMS. Alonso started fifth and finished 24th due to a mechanical issue after leading 27 laps and endearing himself to American fans. “For sure, I think INDYCAR is on the rise, specifically in the United States,” Newgarden said, “but I think there’s some global appeal to what is happening in this world in INDYCAR. You saw that when Alonso came over that there’s genuine interest. It’s not something people are adverse to. INDYCAR is interesting. So I think it will exist regardless if F1 has a bigger presence here. Newgarden added he also could envision himself racing at Le Mans, the mid-June French classic that is the world’s most prestigious endurance race. “Oh, yeah, for sure. I think everyone would,” Newgarden said. When asked, Newgarden added he would prefer to wheel a car in the premier Prototype category over a GT entry. Interestingly, Penske is in his first season of fielding an Acura Daytona Prototype International team in IMSA’s WeatherTech Sports Car Championship with a lineup including former Indy 500 winners Helio Castroneves and Montoya. That series’ premier event is the season-opening Rolex 24 Hour at Daytona in February.